Why slow weapons for Enh. Shamans? 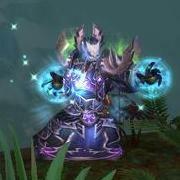 I've recently gotten started with my level 85 Enhancement Shamans. I only played Elemental previously. Admittedly, I never played a melee so I was wondering why people advise me to use slow weapons. Isn't weapon DPS that matters the most? When it comes to raiding, it's always advised to use maces (or axes, for that matter) that are above 2.0 seconds or slower because your Flametongue does more damage. It doesn't matter in speed since Flurry already gives you 30% attack speed, and haste is your worst secondary stat. Thus, that is why you never roll on a dagger (unless it is a desperate upgrade, but will still contribute on a probable DPS loss nevertheless). The slower the weapon, the more damage the weapon itself deals. Ideally, 2.6 second weapon speed is what you should aim for Enhancement. This will give Flametongue more damage as well as your abilities are based off weapon damage so they will do even more base damage, too. Anything below 2 seconds is usually quite a bit of dps loss unless you are going from say a green 306 item to a 397 dagger off of Hagara where the sheer stat gain will make up for the weapon speed in theory. I know that at one point, the reason you needed slow weapons was that Windfury procs had an internal cooldown which resulted in a lower number of procs at weapon speeds faster than 2.0. I don't know if that was changed at any point, since I've not been playing Enhance for several months now. My main is actually an enhance shaman and I love it. Daggers actually are a signifigant dps loss. Back when I was a noob I thougt daggers were cool because they were fast . Someone finally told me I should be using slow weapons because windfury procs have the internal cooldown AND because lava lash is your big damage skill which is based off a percent of your offhand damage. Best of luck with your shaman!!! Like Khaira, I also believe that it's because your most damaging abilities deal a percentage of your weapon's damage and the slower the weapon, the higher the damage. Lava Lash and Stormstrike usually represent 25% of your damage. If you were to use a 1.8 or 1.4 weapon, you'd do between 30 and 45% less damage with these two abilities. So this means total damage loss of 8% to 12%.